Are the Edmonton Oilers in the market for a defenseman? 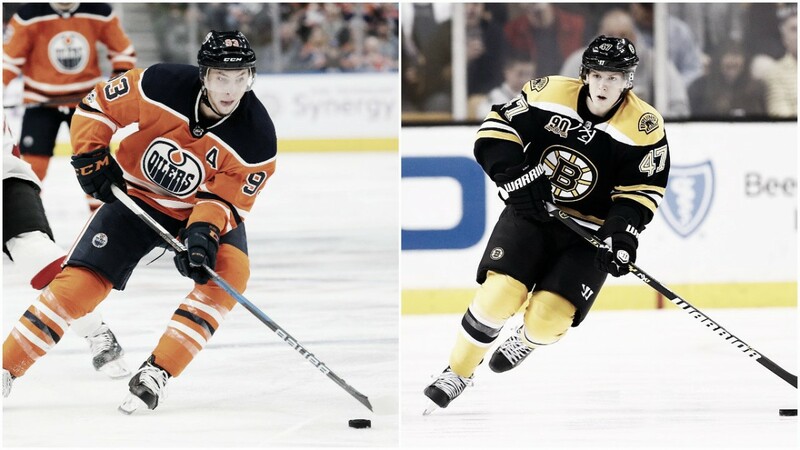 Would a trade involving Ryan Nugent-Hopkins and Torey Krug make sense for both sides? Recently Joe Haggerty of NBC sports made an interesting point indicating that the Boston Bruins have eight defensemen under contract for next season. He interestingly went on to speculate that a name like Torey Krug could potentially be on the market, and wondered if the Edmonton Oilers might be a potential trade partner. Based on the fact that, the Edmonton Oilers recently announced that they will be without Andrej Sekera long term in 2018/19. As a result, the rumors have been swirling around suggesting that a name like Ryan Nugent-Hopkins could be involved in the deal in order to get Torey Krug out of Boston. Considering that the Bruins could add a talent like him to improve their scoring depth up front goes without saying. Here is a deeper look at the situation and the potential blockbuster trade that could happen. At this point, it is all speculation but there are some things that are certain. The Edmonton Oilers are definitely in the market for a defenseman - someone who can play in their top-four. In fact, they will have been looking for one for a while and names like Matt Dumba, Justin Faulk, and even Ryan Ellis have come up in the past. You can definitely see some holes and a lot of question marks surrounding it. Can Oscar Klefbom, Darnell Nurse, and Matt Benning take their game to the next level? Is Ethan Bear ready to give the Oilers 15-20 minutes a night for 82 games this season? Is Evan Bouchard ready to play in the NHL next season? Obviously adding a name like Torey Krug would be a huge upgrade for the Oilers. He would instantly improve their powerplay and give them a reliable 40-55 point defenseman; one they have been desperately looking for over the past several years. But from the Bruins’ perspective, the asking price will be very high. Krug is coming off a career year and looks like he will be in his prime for at least three to five years. On paper, this looks a like a deal worth considering but the Oilers should also be very wary, especially if the Bruins’ asking price is too high. Given that Peter Chiarelli does have a history with the Bruins’ organization, his former employer probably won’t feel the need to go easy on him. It’s also been known that Chiarelli tends to overpay to acquire his talent (Adam Larsson, Griffin Reinhart, Ryan Strome). So it might become a slippery slope for the Oilers, as the Bruins may ask for Nugent-Hopkins plus a few extra pieces. The Oilers should be very hesitant about pulling the trigger on this deal even if it’s a one-for-one (Ryan Nugent-Hopkins for Torey Krug). They had to tank for years to have the center depth (Connor McDavid, Leon Draisaitl, Ryan Nugent-Hopkins) they have today. So do they really want to give that all up now? Or should they wait and see if any of their younger players (Ethan Bear, Evan Bouchard) can step up in a big way? At the same time, Krug is not exactly a number one defenseman so giving up Ryan Nugent-Hopkins and potentially more for him might be another overpay. On top of that, Mr. McDavid’s $100 million contract kicks in this year, so the Oilers can’t afford to lose too many more deals. If you were Peter Chiarelli what would you do? What do you think of these trade rumors? If you were Peter Chiarelli would you pull the trigger? Let us know in the comment section below and be sure to give us a follow on Twitter by searching (VAVELNHL_ENG).